Symantec, Kaspersky Labs, Trend Micro, Sophos and other security vendors continue to surf on the Java 0day targeted attack stuff. 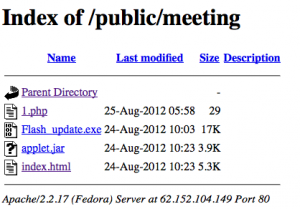 The vendors have agreed, in communion, that Java 0day was potentially used by the Chinese Nitro gang, through spear-phishing campaign. Nitro gang is well-known since another targeted campaign in 2011, reported by Symantec, focusing on … Continue reading "Java 0Day and the Targeted Nitro Attacks Campaign Analysis"